Apologies for the late comic today. I’m getting into a unusual habit where I am doing more than my requite four panels and adding a ton of effects and emotion to my comics lately. This would not normally be considered a problem if I were able to plan somewhat in advance and produce the comic on time. But I’ve definitely been playing catch-up lately. Sorry about that. I know I’m a little behind the curve, since the movie came out last week. But it’s been interesting monitoring the reaction to it online. The general consensus is that the film is amazing to look at, but light on plot. I’m inclined to agree, but I wasn’t really bothered by the deficiencies in the storyline. Maybe it was a case of managed expectations, but when compared to a similar feast for the eyes that was light on plot like James Cameron’s Avatar, I was far less disappointed. If I could make one complaint, the first act of the movie establishes that Jeff Bridges’s character discovers something inside “The Grid” that would change every idea mankind ever had about science, medicine or religion. Once Bridges’s discovery is revealed, the Earth-shattering ramifications aren’t really explored. I think it’s because the filmmakers would rather have us extrapolate the meaning of his discovery, but I would have preferred a little more discussion around it. I really think it would have helped anchor the story and raised the stakes in terms of why this discovery was worth defending. Instead, it feels a little bit tacked on. And I guess if I could make one additional complaint, it would have to be about Jeff Bridges’s performance. Basically, he channeling a digital version of The Dude from The Big Lebowski. Trapped inside The Grid for over 20 years, Bridges’s contemporary take on Kevin Flynn has him adopting Zen principles and an odd delight in calling everyone “man.” For me, it comes off as a little too colloquial and flippant. Again, it diminishes the stakes. But, truthfully, these are petty squabbles. Like I said before, the plot deficiencies in no way subtract from the overall experience Tron: Legacy brings to the screen. The visuals are astounding. Even Bridges’s rubbery, digitized performance as his younger self has an odd allure. It easy to see why Disney didn’t promote Tron: Legacy with a re-release of the original Tron on blu-ray. The visuals Joseph Kosinski’s film blow the original out of the water. While there are several clever references to the original film, this sequel is an entirely different beast. I ended up seeing the film in 3D and I don’t know that it particularly added anything to the experience. I don’t think I felt any more or less “immersed” in the world of Tron than I would have if I had watched it in 2D. Frankly, that’s a compliment toward Kosinski’s direction. I felt like I was leaning into the film the whole time. Despite being somewhat dreary, Tron is a place I wouldn’t mind inhabiting for a while! One more thing I’ll say… there was a lot of hype around Daft Punk providing the soundtrack to this movie. It seemed like a natural fit and something that fans could get excited about. I bought the soundtrack before the movie came out and it left me a little cold. I was hoping for a little more funk and a little less orchestration. I can say now that I’ve watched the movie, the context for the soundtrack has been completely re-contextualized for me. It is much better than I originally gave it credit for because I was too busy focusing on what I wanted it to be instead of enjoying it for what it was. If you enjoy soundtracks, I strongly encourage you to pick it up. Great stuff. I’ve run out of things to say about Tron: Legacy, so I’ll just say that I enjoyed it greatly and leave it at that. I have designs to see True Grit sometime in the near future. Although Cami has been trying to pull together a date night so we can see The King’s Speech. Truthfully, I’m good either way. It’s a win-win! But we’ll see what happens. Thanks for your patience with today’s comic. If you have additional thoughts about Tron: Legacy, feel free to leave them in the comments. See you in 2011! Wow. Between Tron and True Grit, Jeff Bridges is having a pretty good December! 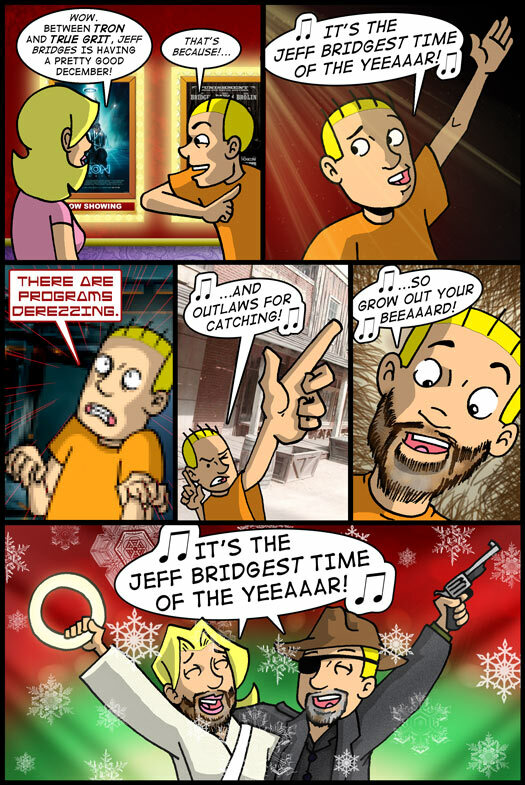 It's the Jeff Bridgest time of the yeeaaar! ...so grow out your beeaaard! I really wish they had re-released the original though. I left the theater really wanting to go home and watch it. I don’t own it, and you can’t get it anywhere (well, except for Amazon through a third party retailer where you’ll pay $100 +). I’m guessing/hoping they’ll do like a collectors edition when the new one comes out on dvd/blu-ray. I’m sure they’ll probably release the two films together at some point. But I think it made sense for them to hold off. If the younger generation had gotten their hands on the original Tron, they would have thought the sequel to be completely hokey. I liked it, too, but I’m a huge fan of the old one. I didn’t realize the original was out of print, I guess; I have the big special edition set they released a while back and watched it with my nephew not too long ago. It was one of those sci fi flicks I grew up with (like The Last Starfighter) that I’m always surprised more people haven’t seen. I think I had the same problem as you, they really didn’t properly explore the new…whatever…that had evolved within the Tron universe. I also felt like I wanted more world building in this one, since it looked so great. They gave us that great former resistance fighter-turned-nightclub owner who had the only really strong personality in the movie, really, but didn’t really give us a universe that would support that personality. There was also a lot that felt like set-up for a sequel. Still, I had fun watching it. Much like the first one, it kind of sets up a lot of potential that’s great. Also, Beau Garrett. Whooboy. I loved the scene in the bar, but the entire time I was watching it all I could think of was The Matrix Reloaded. Saw ‘Tron’ twice, once on Imax the other in 3D. I really enjoyed it both times. I thought the story was very serviceable, not gonna win any awards, just did what it needed to do. There was one aspect that set it out from every other big budget effects film, the lack of a love story. I expected there to be an unnecessary subplot between Quarra (sp?) and Sam. Was pleased when it didn’t happen. Overall I was very pleased with the movie. Really enjoyed the score and the visuals. Thought Bridges was good at the 2 different roles, thought I did giggle every time he said ‘man’. ‘True Grit’ was just ‘ok’. Hailee Stenifeld gives a great performance. There are some strange choices made by the Coens that kinda hurt the movie (imop). Ya gotta remember, man, that he had, like, no contact with the Users’ world for like 20 years, man, so he had no, like, y’know, exposure to the lingual shifts and the advent of the word ‘bro’. Hey, Tom. Saw “The King’s Speech” last night and cannot recommend it enough. It’s great. The story was surprisingly engaging and the acting superb (although with that cast, that’s hardly surprising). Most of all, I found myself actually giving a damn, which is something I haven’t had at the movies in quite some time, cynic that I am. With all due respect to the Cohens, “True Grit” can probably wait; after all, it will probably hang around longer. “TKS” is a little too arty to last more than a couple of weeks. That would be “Coen”, BTW. Darned quick fingers. I haven’t gone to watch Tron yet, but I’ll tell you right now, I’m probably going to end up singing that in the theatre. Thanks. The last movie I saw in the theatre was The Voyage of the Dawn treader, which was. . .convoluted. Still good, but when there’s that much to get through, you lose a lot in translation. Still, being a huge Narnia fan (I’ve read them more times than I know and watched the last two movies at least four times), I had to go to see it, and I was pleased. That’s probably a good segway into Tron, since both involving being sucked into another world. I think I’ll wait to see Tron, however. While the nostalgia is there, I’m not so much excited by flashy special effects and science fiction anymore. I still haven’t see Avatar. I realize liking fantasy usually goes hand in hand with liking science fiction, but I’m fine with being an exception. The movie I’m really excited for is Season of the Witch, which comes out next month. Claire Foy was amazing in Little Dorrit and I’m eager to see more of her. I agree with you about Tron. I haven’t seen the original in a while, but from what I can remember, Legacy is a nod to the original and a re-envisioning of the world. I went out and bought the soundtrack the next day. 🙂 True Grit and Kings Speech are on the docket for this weekend! Can’t wait for your reviews.